CONAKRY, Mar 5 2019 (IPS) - Every year, there thousands of young people, including women and children, who try to irregularly reach Europe and what, they hope, will be a better life. But the journey to Europe has been dangerous for many. This has included experiencing harsh and difficult conditions when crossing both the desert and the Mediterranean, and being subject to scams, prison, violence and racist insults on a daily basis. So why are they risking their lives? 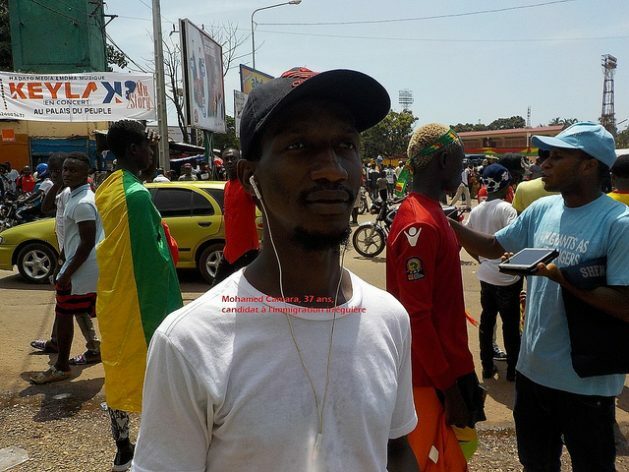 Most of the young Guineans interviewed by IPS mention the low level and quality of education in their country, endemic unemployment and sometimes the destruction of their shops and workplaces during political demonstrations. They say there is “no hope” for them if they stay in the country in the face of hardships and family misery. Some of them also told IPS that they dream of going to Europe to “continue their studies and have the means to support their families”. The International Organization for Migration (IOM) has launched a project called Migrants as Messengers (MaM), which aims to make future candidates aware of the dangers of irregular migration. In Guinea, migrants who have returned home are involved in awareness-raising activities with logistical support and training from IOM-Guinea. However, most of the migrants surveyed have a common cause: that they are determined to permanently repudiate irregular migration because of the unspeakable torments that they have experienced firsthand. Back in Guinea, most migrants have become involved in awareness-raising activities organised by IOM, and have been trained how to interview and record other returnee migrants. He added that if one wanted to work in order to become independent, one had to leave home. How do migrants sensitise Guinean youth? Equipped with an app that has a questionnaire, the returnee migrants take advantage of major events around Conakry, the country’s capital, to educate Guineans on the dangers of irregular migration. They also go door-to-door as part of an outreach to deter both parents and youth. If this initiative is appreciated by some young people and parents, there are others who do not want to understand anything because they are determined, whatever the cost, to take the route of irregular migration. IPS followed the Guinea team on its campaign through many parts of the capital. The MaM volunteers introduce themselves, explain the reasons for the presence of the team, and ask if the youth are willing to answer a series of questions. During a Guinea-Rwanda football match, played in Conakry last year, Béavogui Jean, tablet in hand, showed up in front of a youngster. “I’m here to raise awareness about irregular migration. Our goal is to explain the suffering involved in this unfortunate adventure in the desert and in the host cities. That’s why we come to young people to raise awareness,” he began. This teenager immediately stopped him and said: “I am busy”. “I have talked to people there; they said it’s better than here. Even if you do not find enough, having something to eat is easy. Life is beautiful,” he says. “In any case, what interests me is to enter Europe, whatever the route,” he concludes. Mohamed Camara, 37, plans to go to the West. But, with the advice and information provided by MaM volunteers, he now promises to travel through the regular channels if he has the means to do so. IPS follows the migrants in their door-to-door outreach at Lansanayah Barrage, a neighbourhood in the upper-class suburbs of Conakry. During this awareness day, the team visited homes, young people at a tea gathering, and in bars.